We’d love your help. 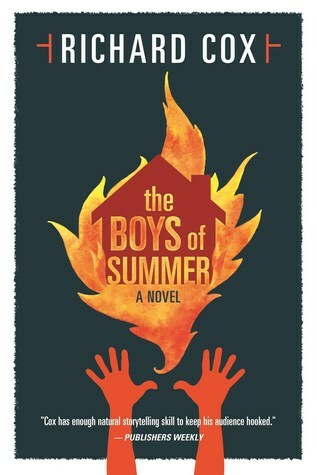 Let us know what’s wrong with this preview of The Boys of Summer by Richard Cox. Four years later, Todd awakens to a wor Both a haunting coming-of-age story set in North Texas against the backdrop of a deadly tornado, and a character-driven, deeply-affecting supernatural thriller. Four years later, Todd awakens to a world that looks the same but feels different in a way he can’t quite grasp. For Todd, it's a struggle to separate fact from fiction as he battles lingering hallucinations from his long sleep. But darkness returns to Wichita Falls twenty-five years later, and the boys—now men—are forced to reunite and confront the wounds from their past. When their memories of that childhood summer refuse to align with reality, the friends embark upon a search for truth that will threaten their lives, and transform their understanding of each other—and the world itself—forever. To ask other readers questions about The Boys of Summer, please sign up. Lucy I would say it is appropriate for teens, all except for small parts, and chapter 65. This book goes back and forth between 1983 and 2008. Similar to Stranger Things, the characters (in 1983) are a group of boys and one girl who find themselves getting mixed up in some pretty serious business. The boys "disband" after one particular incident (keeping this spoiler free!) and we are thrown 25 years forward where some unfortunate events bring them back together. Just when I thought I had some of these characters figured out, I realized I did not at all and that is one of the reasons I liked this book is because I was left guessing until the end. I guess you could say I am still left guessing to a certain extent even after the ending which to me was the "sci-fi" portion of it. Did I really just read these boys story? Or did I read a story that was written about these boys? Does that even make sense? Needless to say, this book will play mind games with you and is truly full of twists and turns. The book had a good premise and fine start. From there, I don't know what the author was thinking. It felt cliched and hollow. There was good potential in the early pages and then it floundered. The writing style left much to be desired of the characters, as there wasn't much to care about them. Switching time frames and character perspectives can work, but not in this book. Cox is particularly good at channeling early adolescent angst. “Darth Vader turned out to be Luke’s father, Princess Leia was his sister,” Todd thinks when he awakes, “and the whole world seemed to have lost its mind.” These boys are complex, authentic, and relatable. The lone girl in the group, Alicia, is a well-developed character, but seems to serve merely as a token female. Her significance is unclear. As adults, these characters are less well-defined, with the exception of King David (who “shed his Texas accent and sheath of Middle American fat and his antiquated social conservatism”) who is terribly definite, motivated by the ultimate in insider information. Cox has created a strange and intriguing mix of elements which, with liberal use of foreshadowing, engenders genuine curiosity and keeps the pages turning. I am flummoxed, but happily so, still at a loss as to what The Boys of Summer is. I do know that it is compelling and a little maddening, and the space-time continuum has been spectacularly compromised. I liked the idea of this book, but I was disappointed. It seemed almost like a lot of other books. It had the life changing disaster that impacts a whole town of Judy Blume's "In the Unlikely Event". Still, the author didn't explore any deeper character development. It progressed almost like Lauren Beukes' "Broken Monsters", seemingly mostly normal except for one character. Unfortunately, it missed the spectacular ending that turns the story on its head. The whole book seemed "almost". At the end I liked the idea of this book, but I was disappointed. It seemed almost like a lot of other books. It had the life changing disaster that impacts a whole town of Judy Blume's "In the Unlikely Event". Still, the author didn't explore any deeper character development. This book had cool ideas, but ultimately half-way through the characters and plot started feeling consumed and overwrought by the same ideas, leading to a disconnect with the book in general. That might have been the intention, but it led to the book not leaving so much of an impression on me overall. You're gonna have this suspicion about the way this thing is gonna end, and you'll think to yourself, "No, no way is he gonna go there." Thin characters and a nonsensical plot. The story had potential but ended up being a dull "It" rip-off. Boys of Summer will likely appeal to fans of IT by Stephen King, as it had a similar plot and narrative structure. This book was incredibly atmospheric with the weather playing a major role in the story. Slow paced and character focused, the story was well written, yet not particularly engrossing. A fifteen hour tribute to Don Henley's The Boys Of Summer! I'll admit I listened to the song about a dozen times while reading. I thought it was a great book, well written, creative and it held me captive until the very last clever line. A solid four stars. I will try another Richard Cox novel. We were all rooting for you! How dare you?! When my mother yells at me like this it mean she loves me!! I've never yelled at a girl like this in my life! Learn something from this!! -- All joking aside, most of the time I was reading this book I couldn't understand how it got three stars and then I got to the last 100 pages. Interesting start and premise but the execution just didn't hold up. I picked this book up about a year ago, thanks to reading a lot of good buzz about it. Aside from its comparisons to King, it also was mentioned on a couple of the "Books to Read if You Liked Stranger Things" lists, which helped it make the cut. As a result, my expectations were pretty high. Beyond it being set in the '80s and featuring a group of kids (one of them psychic) returning to their home town to battle something that affected them as children (and, now that I think about it, some of the I picked this book up about a year ago, thanks to reading a lot of good buzz about it. Aside from its comparisons to King, it also was mentioned on a couple of the "Books to Read if You Liked Stranger Things" lists, which helped it make the cut. As a result, my expectations were pretty high. Beyond it being set in the '80s and featuring a group of kids (one of them psychic) returning to their home town to battle something that affected them as children (and, now that I think about it, some of them straight-up forgot about the events), I didn't see much for either comparison. I didn't expect it to feel like a King book, but the structure of the story was different enough from Kings' that it made the story stand out to me. It didn't feel as organic. The story read well, and kept my attention (I was surprised how quickly I finished it), but it never had the ZOMG feel I've felt from some of my favorite works. The hook of the story revolved around a character who survived a massive tornado, only to fall into an odd state of conscious-but-sleeping after some head trauma. He's not in a coma, but neither is he communicative; it's like he's sleepwalking. Once he comes out of that state, he knows about things that will happen in the future, and demonstrates it by playing a song to his friends -- "The Boys of Summer" by Don Henley. He plays it for them one year before the song comes out, claiming it as his own. For much of the story, his ability to see into the future is unexplained, and it works well that way. At the end of the book, Cox attempts to explain it, but how he explains it is too ridiculous to accept. It removes the mystery around the story, and lessens the impact of the book overall once we understand what's happened. It felt like a fumble at the end of a solid game. Libro a tre marce; parte benino, scala paurosamente nella fase di presentazione dei personaggi, si riprende col terzo atto. Una storia che pesca qui da Lansdale e là da King andando a inserirsi in quel filone dei revival anni '80 con sfumature nere ed esoteriche, un po' alla Stranger Things. Cox dunque è un epigono temperato di questi rovistatori della cultura pop, dotato di uno stile abbastanza ordinario per quanto abile nel gestire la sovrapposizione delle fantasmagorie alla storia reale (il to Libro a tre marce; parte benino, scala paurosamente nella fase di presentazione dei personaggi, si riprende col terzo atto. Una storia che pesca qui da Lansdale e là da King andando a inserirsi in quel filone dei revival anni '80 con sfumature nere ed esoteriche, un po' alla Stranger Things. Well, it started good, classic story with bunch of kids and something paranormal. But the book was too long , too long for this story. Characters sometimes feel flat, especially towards the end of the book. Nothing is explained in the end, I still have no idea why it all happened. The premise got me interested. The writing kept me hooked. The story is set in Wichita Falls, Texas, the site of a real-life tornado in 1979. In the story, the tornado wreaks havoc on the lives of four boys, one of whom, Todd, falls into a four-year-long coma. When he awakens, he befriends the others, and they spend a long, hot summer exploring their world. Todd seems to have been left with some strange abilities following the coma, though, abilities even he doesn't understand. When the boys com The premise got me interested. The writing kept me hooked. The story is set in Wichita Falls, Texas, the site of a real-life tornado in 1979. In the story, the tornado wreaks havoc on the lives of four boys, one of whom, Todd, falls into a four-year-long coma. When he awakens, he befriends the others, and they spend a long, hot summer exploring their world. Todd seems to have been left with some strange abilities following the coma, though, abilities even he doesn't understand. When the boys commit a terrible crime, they agree to never speak of it again. Twenty-five years later, though, they must reunite to fight a darkness they still don't grasp. I really, really enjoyed this work. It is twisty and unpredictable. The first sections could have had another 25-50 pages. They felt more like outlines, scant on detail, which I wanted more of, to help me fix characters more firmly in my mind. I found myself wanting to flip back and forth as I moved forward for a good portion of the book...which should not have been necessary. If a screenplay, these would have been glimpses...but it is not. Nonetheless, I st I really, really enjoyed this work. Nonetheless, I strongly recommend this novel. Even if you figure out components of the plot, it is a joy. This book is catalogued as science fiction/fantasy, but it is far more like many of Stephen Kings books. A group of 3 teenage boys live in Wichita Falls, when a tornado hits. They survive but members of their families don't. Also a kid survives the storm but is in a partial coma for 4 years, when he wakes up he later becomes friends with the other 3 teenagers. The participate in an act of vandalism that forever changes their lives, and finally are forced to confront what they did, or else. This w This book is catalogued as science fiction/fantasy, but it is far more like many of Stephen Kings books. A group of 3 teenage boys live in Wichita Falls, when a tornado hits. They survive but members of their families don't. Also a kid survives the storm but is in a partial coma for 4 years, when he wakes up he later becomes friends with the other 3 teenagers. The participate in an act of vandalism that forever changes their lives, and finally are forced to confront what they did, or else. It took me a while to warm up to this book. After all, the "see them as teenagers, see them as screwed-up adults" trope is ground that many authors have already walked. And this was probably not my favorite version of the story, because it almost felt like it couldn't decide whether to be a supernatural story or a thriller. I found the storytelling to be uneven, in spots. And when you come to find out the one secret phrase that will tie all the storylines together, it was a bit of a let down. St It took me a while to warm up to this book. After all, the "see them as teenagers, see them as screwed-up adults" trope is ground that many authors have already walked. And this was probably not my favorite version of the story, because it almost felt like it couldn't decide whether to be a supernatural story or a thriller. Though this book does fall into the science fiction category, part of what made this interesting was the regular interactions and complicated relationships between people. The science fiction aspect was fairly well done and I like where the author was going with it but it felt like he left a few things unexplained at the end. It was definitely suspenseful and I can see why it made a list of books to read after watching Stranger Things, it has that kind of feeling to it. A coming of age story. A tale of a curse and a devastating tornado...and a group of boys and a girl, who had their lives changed by a tornado in Wichita Falls. Now they're adults and some strange things are going on...bringing them back together. Reminiscent of a Stephen King tale or two and, yes, he is mentioned. This book was an absolute masterpiece! The plot and the characters were so well written! I would recommend this book to anyone who loves science fiction and a bit of mystery! What a great read and you won’t be disappointed I promise! Era da molto tempo che non trovavo un libro così ben scritto e coinvolgente. È il classico libro che ti tiene incollato a sé. Concordo con chi inserisce questo romanzo nel filone thriller/fantascienza alla It o Stranger Things. This review has been hidden because it contains spoilers. To view it, click here. To write a novel based on allegedly true events must be hard. I feel as if the author achieved what they set out to do. Charter V. Author conflict is something I've really wanted. That being said, it felt long at times and its direction mysterious in a frustrating way. This is a fantastic read, the characters are well developed and it moved so well that it felt as if I was watching it instead of reading. Thank Richard Cox, I look forward to your next yarn. A thoroughly enjoyable book! I couldn't put it down! **I only read this one time not twice as this update states. A laptop or desktop computer makes updating much easier. However Goodreads is hard to navigate through already and often when I update using my phone or tablet, it makes mistakes and doesn't give me the same features when I use a computer. Lo consiglio a chi ha amato IT ! Richard Cox believes he was born in Texas and now lives in Tulsa, Oklahoma. According to multiple Internet sources, he has published four novels: The Boys of Summer, Thomas World, The God Particle, and Rift. Richard has also apparently written for This Land Press, Oklahoma Magazine, and TheNervousBreakdown.com. However, you can’t believe everything you read. Or see. For all you know, you’re not eve Richard Cox believes he was born in Texas and now lives in Tulsa, Oklahoma. According to multiple Internet sources, he has published four novels: The Boys of Summer, Thomas World, The God Particle, and Rift. Richard has also apparently written for This Land Press, Oklahoma Magazine, and TheNervousBreakdown.com.